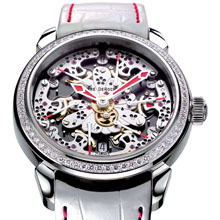 Women also love fine mechanical watches. And it is to them that PIERRE DEROCHE has dedicated this superb interpretation of the Calibre Royal Retro. With its display of six retrograde seconds hands, the movement is unique in its genre. These hands, on the visible movement, take over from each other for ten seconds, creating a fascinating mechanical ballet and making each minute seem like a moment of eternity. This magnificent complication is enhanced by the finishing, which is designed by a woman for women and gives this timepiece a poetic and floral touch. The elegantly-shaped bridges are adorned with delicate motifs, highlighted by a subtle setting of jewels. The bezel, also set with jewels, adds a touch of sublimity to this harmoniously designed piece. A watch that women will love a little, a lot, passionately, or to distraction. For four generations, the family of Pierre Dubois, founder and CEO of Pierre DeRoche, has passionately cultivated the science of calculating time, a savoir-faire initiated in 1901 by his great-grandfather Marcel Dépraz, founder of Dubois-Dépraz. He was succeeded by Reynold his son-in-law, Gérald his grandson, then his great grandchildren Jean-Philippe and Pascal, Pierre Dubois' brothers. A heritage transmitted and developed from generation to generation, and marked by over fifty patents registered in 100 years. Not only a family of dedicated watchmakers, but real trailblazers. More than a brand, Pierre DeRoche is all about a family spirit, that of the Dubois and the Dépraz families, living since the 1500's in Le Lieu, a small village in the Joux Valley, in the heart of Switzerland's watchmaking region. Today, it is through the Pierre DeRoche brand that Pierre Dubois and his two brothers Jean-Philippe and Pascal explore the boldest ideas and create technically sophisticated and exclusive timepieces, following in their predecessors' footsteps. With their deep horological roots and knowledge of cutting-edge technology, Pierre and Carole Dubois are committed to the development of Pierre DeRoche. Their business is a perfect synthesis of family origins and a spirit of independence, both of which form an integral part of the Dubois family's DNA.